For the greater part of a decade the US, the UK and the EU have been carrying out a campaign to undermine and overthrow the Russian government and in particular to oust President Putin. Fundamental issues are at stake including the real possibility of a nuclear war. The Ukraine fragmented – Russia allies took control of the East; Crimean voted for unification with Russia. Syria joined with Russia to defeat armed US vassals. Russia turned to China’s multi-lateral trade, transport and financial networks. 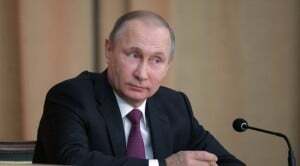 President Putin is immensely popular in Russia and hated by the US precisely because he is the opposition of Yeltsin – he has created a flourishing economy; he resists sanctions and defends Russia’s borders and allies. Russia will remain a global power. It will continue under the leadership of President Putin. The Western powers will divide and bugger their neighbors – and decide it is their better judgment to accept and work within a multi-polar world. Prof. James Petras is a Research Associate of the CRG.